Create, Connect and Share Respect: Safer Internet Day 2018! The theme for this year’s International Safer Internet Day was: Create Connect and Share Respect: A Safer Internet Starts with you. 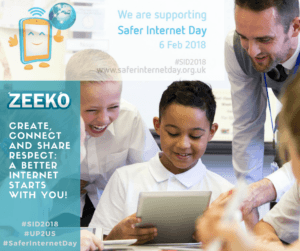 As the name suggests the aim of the day, which took place earlier this week is to encourage users of the internet, particularly young people to use the internet safely and responsibly. So what is the best way to communicate this message to kids, as a parent, a teacher or both? A major theme of the interactive workshops we deliver to schools is letting children know that good digital citizenship starts with them! The internet and digital technologies are undoubtedly a fantastic resource, but those using them need to be aware of their personal safety and be careful of what they share. Making smart choices when they are online is a key to staying safe. The increasing use of apps like Instagram and Snapchat is revolutionising how young people communicate and certainly contributes to increased creativity. However, it can also lead to too much information being shared and an increase in cyberbullying. Teaching children to respect others has always been a very important element of parenting, it is now an integral and essential part of what is termed ‘digital parenting’. Helping your child to understand the importance of exercising the same amount of caution when they are online as they do when they are offline is a very important step in helping them to manage in the digital world. Having regular conversations with your child about the importance of being conscious of the feelings of others when they are sharing content online is also a key step. This can be particularly challenging when it comes to teens. Try to communicate often and make sure that your teen knows that they can talk to you about their online activities. Encourage them to be conscious of others in any messaging that they may be engaging in, via for example a WhatsApp group. Encourage them to find ways to connect that don’t always involve technology or being online. Having a balance in the use of technology is very important for all the family but particularly for children and teens. The development of face to face communication is a lifelong skill and shouldn’t be neglected. Creating a ‘Digital Contract’ for your family is a great way to get everyone involved in the way technology and the internet is used in your home. Both adults and children sign the contract and it can be reviewed regularly. It can include things like the amount of screentime that is allowed each day or week and can also include rules regarding cut off times for the use of screens in the run up to bedtime, for example. Our ongoing research at Zeeko into children’s use of the internet and digital technologies tells us that children at younger and younger ages are communicating via the internet. It is certainly a key communication tool for them but educating them about how best to use the internet safely continues to be very important.